Little Miss One is a nurturer, she love kittens, puppies and teddies. So, when a dinosaur arrived into our house to review I was very interested to see how she would welcome her new friend. 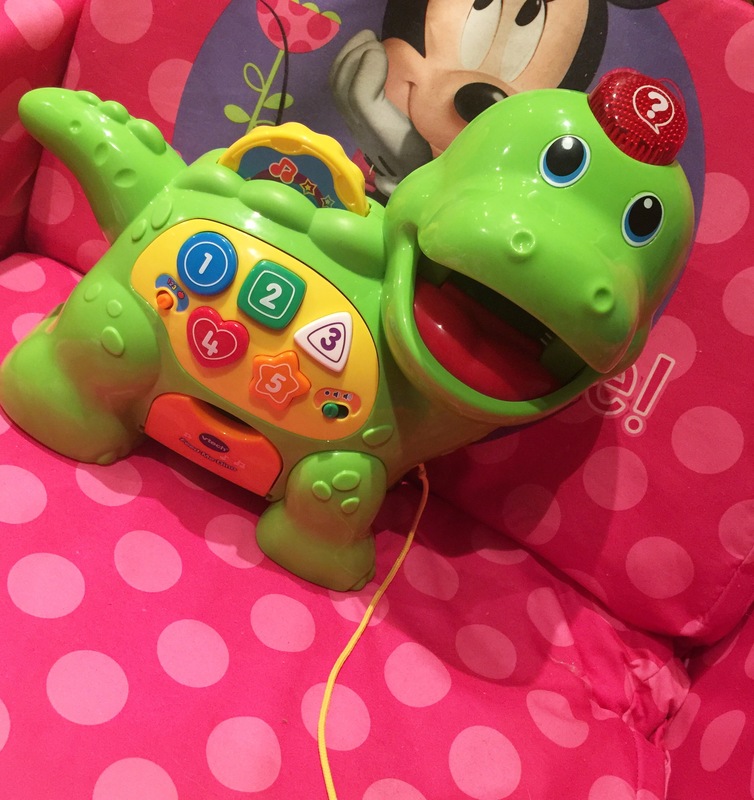 The dinosaur in question was another clever toy from Vtech called ‘Feed me Dino’ and the second he arrived Miss One was in love. His bright colours and friendly face were an instant hit with my cheeky little girl. The minute it took to take him out of the box was the longest minute of not only her life but all that surrounded her as she screamed the house down, eagerly wanting to play with her new mate. 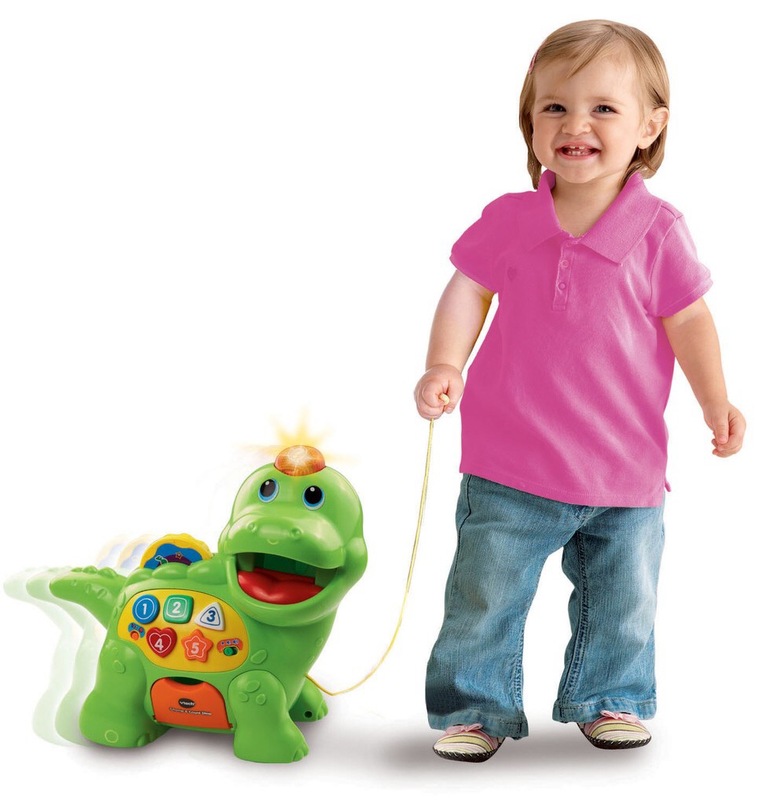 After opening up the box I quickly handed the bright coloured Dino over to a very excited Miss One who decided to welcome her new friend she would take him for a walk using the pull along string attached to the Dino’s neck. This went on for the next half an hour as a delighted Miss One squealed with happiness as her new friend followed her everywhere. After the poor Dino had racked up more k’s than any Dino should I sat Miss One down and showed her how he worked and the pair of us got to explore all the features. She loved pressing all the buttons and dancing along to melodies. One of her favourite features was pushing the discs into his mouth, over and over and over again! Within just a few days she could do it all by herself and the Dino had officially become her favourite toy. Doing this Vtech review was an absolute walk in the park because yet again it’s another quality toy that kids love. The thing I love most about Vtech toys is they are designed well and teach life skills while your children play. Miss One quickly learnt the mechanics of the Dino and couldn’t get enough of it. Hearing her giggle as the food dropped down and she had to retrieve it was an absolute joy to watch. Ten points to Vtech on another fabulous toy. Clever interactive Dino eats and recognises the eight colourful food pieces you feed him. 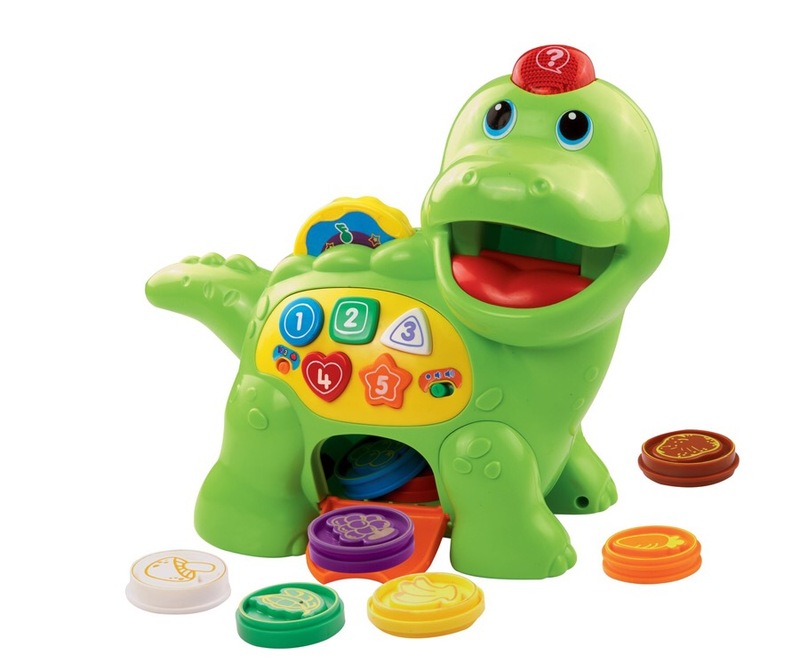 Spin the disc on Dino’s back to hear over 100 melodies, sounds and fun phrases. Push or pull Dino to trigger more fun sounds effects and melodies. Press buttons to introduce numbers, counting, music notes and shapes, and a light-up head button will trigger a question and answer game encouraging play and repetitive learning. pushing it around just in a nappy. There were no vtechs when I was a little miss! If I win, I would share with our baby nephew, our miracle boy who would love a new toy. My Grandpa gave me a plastic tricycle on my 2nd birthday, I used to ride it all the time. My younger brother used it after me and A couple of years back when I visited my parents home it was still there but not any more as a tricycle. My mom cut it into Half to make a ‘flower Pot’ with its rear portion. I was so amazed seeing it surviving so many years and still serving a purpose , may be a bit different though! My dad let me help him figuring I would never remember. We made a wooden naughts and crosses board. It was small and the pieces were cut pieces of dow with each end done in a coloured paint. After dozens of moves it’s in a box here somewhere. He still loves woodwork and has retired and made a motorbike rocker for my nephew and spends his time in woodwork classes. He made my bed headboard and all my shelves. Love a handy wood dad. Just fixed my girls balance bike handlebars after she threw it down in a tantrum and snapped it. Mine was a doll given to me from my nan. The doll was from my favourite TV show called lift off. My dear nan has passed now and the doll has seen better days but both hold a very special place in my heart. I too was a nurturer…I loved animals..all of my toys were animal toys (my parents were vets so loving animals was pretty much unavoidable). I loved high stepper so much that I thought she should join me in the bath one day..because who doesn’t love a bubble bath!? Against my mothers wishes the electronic horse slipped off into a nice warm bath one night…never to work again.